Are you tired of offering guests a nice cup of tea, only to worry obsessively if it’s watered down, or – worse – watch them wince after a bitter first sip? Keep reading for some key tea steeping tips that will ensure a phenomenal cup each and every time. Before placing the kettle on the stove, there are a few important things to understand about tea, first and foremost. All tea hails from the same plant. That’s right. Whether your pleasure is black, green, white, or oolong, it all comes from the same plant – the Camellia sinensis. And because there is no difference in the actual leaf, the strength of a particular tea has absolutely nothing to do with its origin. Distinctions are made once processing takes place, and oxidation of the leaves occurs. The size of the tea particles being used is also integral. Loose leaf teas are graded according to the size of the leaf being used, whereas tea bags typically contain smaller remnants (i.e. broken leaves) resulting from all other processes. It is important to note that all teas naturally contain caffeine, except those that are decaffeinated using chemical solvents, carbon dioxide, or other processes. Black tea has more caffeine than green, which has more caffeine than white. Herbals are not caffeinated, but, then, they’re also not teas. Herbals are made from dried fruits, flowers, herbs, and spices, and include beverages such as chamomile, echinacea, hibiscus, peppermint and ginger tea. Obviously, using 3 teaspoons of tea instead of one is going to yield a stronger beverage. But what’s the ideal ratio? In many cases, the amount used is going to be influenced by the tea itself, as teas can be flavored in a number of different ways. 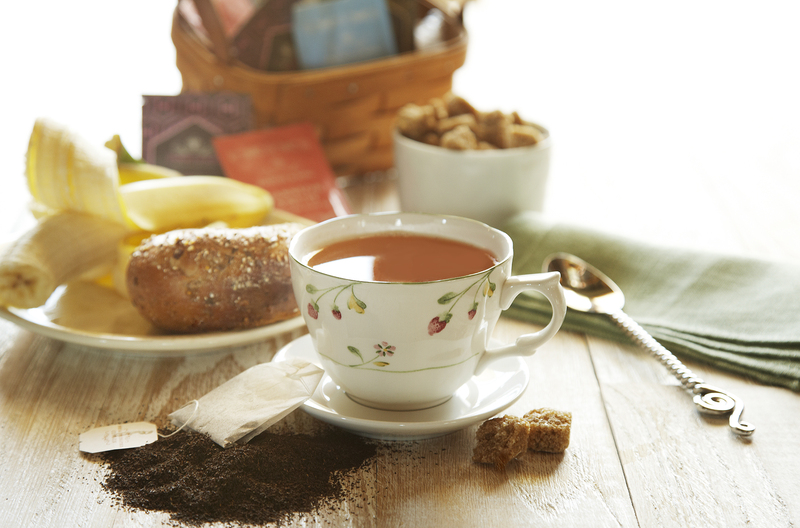 Earl Grey, for example, is flavored with bergamot, a citric oil. Adding too much will yield an overpowering flavor. Personal preference is the predominant factor when deciding how much tea to use. Orinoco’s specialists recommend a minimum of 2-3 teaspoons per cup. Anything lower will result in a weak cup of tea. Don’t panic if you overestimate, however, and wind up with an overly-aggressive taste. Simply add hot water gradually until you reach your desired potency. Time and temperature are essential. Black tea requires the hottest temperature – approximately 195 degrees for four minutes. Green tea should be steeped at 185-190 degrees for five to six minutes. White tea calls for 180-degree temps and 6-7 minutes of steeping time. Interestingly, Orinoco implements these times whether we’re making one cup or 20,000 bottles. Loose leaf tea can be steeped using tea balls, tea bags, and an assortment of filters. Steeping tea can be as simple as putting tea kettle on stove, adding tea to it, and then running everything through a metal strainer. And while we are inclined to use a tea ball, the method you are most comfortable with is typically best. Orinoco loves a great cup of tea. Our team prides itself on sourcing the finest tea leaves from exotic locales, and our wide selection of bagged and premium loose leaf tea is extensive and ever-changing. Shop online today and receive free shipping on any order over $25.